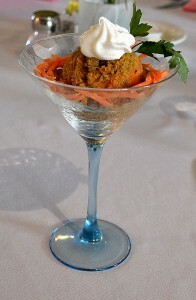 Enjoy this yummy Carrot Soufflé recipe straight from the Grace Ridge kitchen! Steam carrots for 10 minutes. Blend steamed carrots until soft. Add eggs and blend together until the mixture is creamy. Add sugar, flour, baking powder, vanilla, butter and nutmeg to the mixture. Pour combined mixture into a greased casserole dish. In a separate bowl, combine topping ingredients (Cornflake crumbs, brown sugar, butter and walnuts). Sprinkle topping mixture over the carrot soufflé mixture and bake at 350°F for 25-30 minutes. Enjoy! And let us know how your Carrot Soufflé turns out.